At Manchester Rd Dental Surgery, we provide a variety of orthodontic options for clients of all ages.We understand the importance of straight teeth for proper function in eating and speaking, improved self-esteem, ease of cleaning, and healthier gums and teeth. We hope to be the familiar face you’re comfortable to deal with for not only orthodontic needs but also for your ongoing general dental care. For children, we recommend an initial orthodontic assessment when they are 7-9 years of age as this is when we can assess the jaws as well as the teeth that are present and those that are yet to erupt. At this early stage we can determine to risk or presence of problems such as malocclusions or “incorrect bites”, crowding, impacted teeth, deep bites, open bites, cross-bites. Detecting these issues early has the benefit of being able to address them whilst the jaws are still developing and the bone is soft. This means that treatment can be easier, faster and more effective than when carried out solely in teens or as adults where more complex and costly treatment or surgery may be required. Often treatment may not need be carried out immediately but the window of opportunity of early treatment is not lost, and we are happy to continue monitoring the situation closely during their regular dental check ups to ensure ideal timing of orthodontic treatment. In the majority of 12-13year olds, all the adult teeth minus the wisdom teeth are through, and any problems with crowding, spacing, or the bite will be obvious. This makes it an ideal time to address the positioning of teeth. There are a number of options available to cater for different priorities. Braces are an efficient and the most common option to move teeth. Brackets are bonded to the teeth and are joined with a flexible wire to gently move teeth into an ideal position. 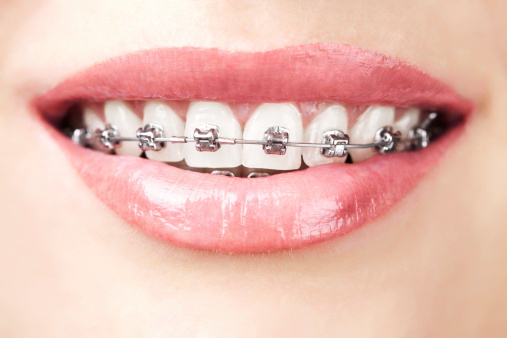 At Manchester Rd Dental Surgery we offer small metal braces to make it easier to clean, and light forces to ensure a more comfortable experience. Clear/invisible braces are also available, however not every case may be suitable for them. They are removed during meal times so unlike braces there are no food restrictions. It is never too late for straight teeth! A beautiful smile is a powerful asset in both personal and professional life, not the mention the functional benefits of improved speech and chewing, and health benefits gained when teeth and gums are easier to clean. We understand that there are many adults who would love to improve their smile and oral health, but feel they have passed the ideal time to consider orthodontics especially when factoring in lifestyle, time, and aesthetics. It is worthwhile remembering that there are a variety of options available, some more discreet and subtle that traditional metal braces, that can also be lifestyle friendly for adults. Braces, both metal and clear, are still an option despite growth having finished, and remain an efficient option for tooth movement. Sometimes combinations of treatment modalities are required to achieve an ideal smile. In adults, we frequently see teeth that are misshaped, missing, worn, or filled. There are times this can be fixed restoratively i.e. with fillings, veneers, crowns. Other times, a better result may be achieved by moving the teeth into an ideal position to work with first. As your treating practitioner, we are in the best position to plan the entire process in detail knowing what outcome you’d like to achieve before you even start should you require both restorative and orthodontic work.